Says the famous Vietnam War draft-dodger. I don’t believe he’d have gone in there without weapon. What a wanker the man is. The fact that he made such a claim shows how far from reality his rhetoric is. Trump is a Chicken Hawk. First responder rule number one. Your own safety comes first. A well trained cop would have waited for swat or in NZ speak the armed offenders squad to turn up. Correct, and one of the finest arguments for the 2nd amendment. And I would’ve stopped Ryan Crotty from scoring that try by barreling him around the rib area. Cadet Bone Spurs is so courageous! Do you believe Trump would’ve gone in there on his own with no weapon, & if so, why? No. Too much b.s. too little evidence. Do you think they should send him in unarmed to the next available shooting incident so we can find out, & if not why not? He’d probably get shot from behind if the Left had any reps there. Wouldn’t bullets just bounce off a hide as thick as his? Only in Deutschland would a man with two wives who he married when they were 13 and 14 be allowed to seek “sanctuary”, be given free accommodation and full state benefits. It’s charming how the women have got separate rooms. According to the boss husband this ensures no tension. You’d have to ask yourself how does this benefit Germany and the lives of Germans. Snopes evaluation suggest most of the story is false or unbelievable. What such idiots ignore is this. How did this nonsense make the MSM? if you just want a steady diet of the..Kardashians who showcase every thing great about the ‘American Dream’…try the Daily Mail…Al. Patience. We are getting there, B. Get you all upset to see reality in the paper Alan ? Best stick to WUWT with the rest of the ostriches snowflake. 2000: “According to Dr David Viner, a senior research scientist at the climatic research unit (CRU) of the University of East Anglia,within a few years winter snowfall will become “a very rare and exciting event”. gee PDB you oculd have given a link to your source. I like laughing at the whacko blogs cranks get information from. You’re far too easy to wind up Griff – I can just see you now looking for your Zimmer frame in order to stomp around the house in a rage. Dr David Viner said it so he must’ve…….said it. Top ‘climate change specialist’ as well so according to you can never be….wrong. 2013 Mott MacDonald announcement: “Mott MacDonald has appointed Dr David Viner as principal advisor for climate change. An internationally recognised expert, David brings with him 20 years of experience working in the area of climate change. David worked for 17 years at the University of East Anglia’s (UEA) Climatic Research Unit, where he developed a worldwide reputation working across all areas of climate change. He led UK public engagement on climate change adaptation and advised both the UK government and international agencies. During this time he was also director of the UEA’s innovative climate change masters course. In 2007 David took up a new position as Natural England’s principal climate change specialist where he developed an adaptation framework and indicators for climate change. In 2008 David was appointed global director at The British Council where he developed a ground breaking cultural relations strategy and programme that was delivered through 250 offices in 109 countries. Working across UK government departments and in collaboration with international agencies, businesses and national governments, the programme was publicly endorsed by the UK government, the United Nations Framework Convention on Climate Change and other leading agencies. The issue my friend is cranks looking at Britain’s present cold spell and claiming it means something. 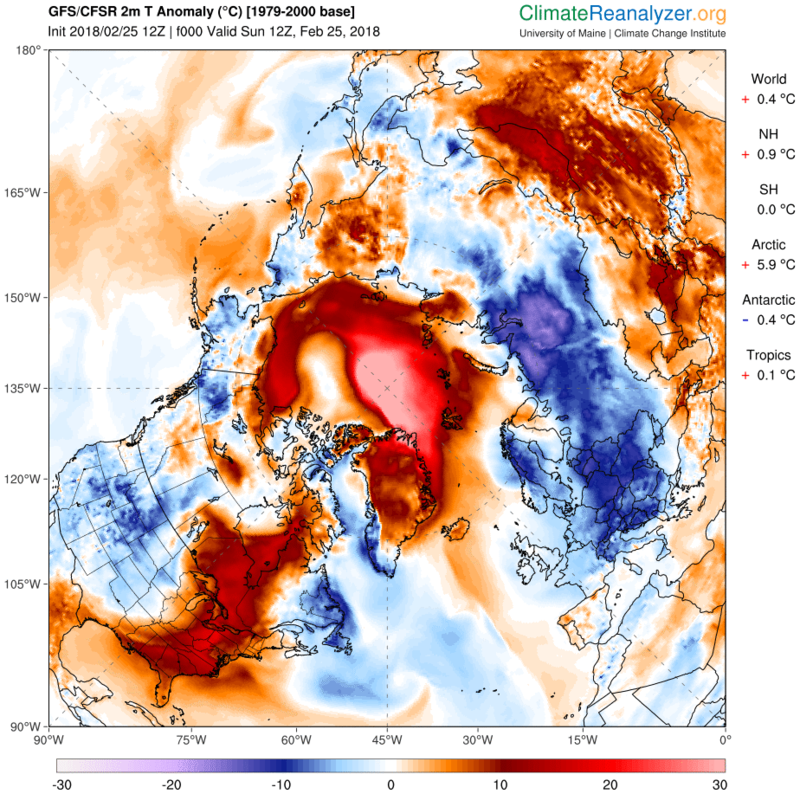 While ignoring the arctic circle is 30C hotter than average for this time of the year. All you have is a random comment from one man over two decades ago you found on some cranks blog. Two decades ago we did not know that a warming arctic would cause the jet stream to go haywire and make weather extremes multiply all over the northern hemisphere.